While IT's pervasive expansion has facilitated many positive environmental and societal gains, there are also unexpectedly severe and growing impacts from the global electronics boom. Can a parrot get justice under a Regional Forest Agreement? Regional Forest Agreements (RFAs) and their ability to effectively protect endangered species have recently been the basis of a high profile legal action brought by Tasmania's Senator Bob Brown. Now, two independent reports have found RFAs to be wanting. The burgeoning environmental industry is giving rise to an international-scale employment transformation. With an increasing list of endangered mammals slipping towards extinction in Australia, leading ecologists are aiming for solutions with more effort on science-based changes in management practices on the ground. A recent Australian study suggests that land clearing over the past 200 years may have been as significant a factor in this country's droughts and changing climate as increasing carbon dioxide in the atmosphere. 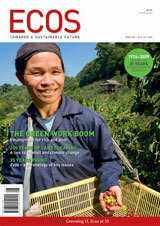 This year, Ecos celebrates 35 years of publication and 150 issues, making it one of the longest running environment and sustainability magazines in Australia. With aftershocks of the international finance crisis still reverberating in late May, challenging industry and government leaders to re-double environmental and social development commitments was ambitious. But that was what this year's 10th National Business Leaders Forum on Sustainable Development achieved. During an expedition to the shelf edge of the Great Barrier Reef, scientists captured the first images of the life associated with rolling undersea dunes and discovered a large community of aggregated brittle stars that have spectacular luminescent behaviour. The 21st century has seen a proliferation of new social change movements driven by grassroots community activism. Our energy dilemma: biggest loser – or clean winner?